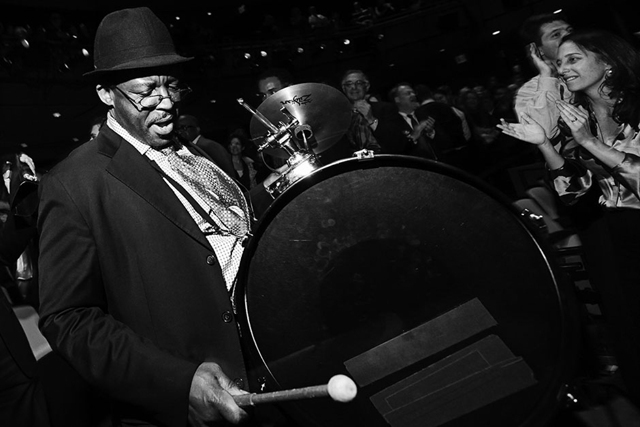 With Herlin Riley, drums; Emmet Cohen, piano; Russell Hall, bass Veteran drummer and founding Jazz at Lincoln Center Orchestra member Herlin Riley has been the drummer of choice for bandleaders such as Ahmad Jamal and Wynton Marsalis. Riley’s sound is rooted in his home of New Orleans, but his rhythmic vocabulary expands miles beyond any one style or location. At Dizzy’s, he will demonstrate his skills as bandleader, with a quintet featuring some of the best young talent in New York. Riley’s group includes pianist Emmet Cohen and bassist Russell Hall, two young players in high-demand among Jazz at Lincoln Center Orchestra members and other high-profile artists. Groove comes first when Riley is on drums, and these performances are going to be a good time!